By almost a 2-to-1 margin, Manhattan Beach voters last week supported Democrat Hillary Clinton over Republican Donald Trump for president, 61%-32%. It was a big change from the 2012 presidential election, when local voters narrowly favored incumbent President Barack Obama by 50%-48% over Republican Mitt Romney. MB had given Obama 57% support the first time he was on the ballot in 2008. 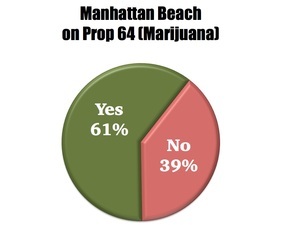 On marijuana, Manhattan Beach voted 61%-39% in favor of Proposition 64, which will legalize and regulate marijuana more like alcohol. This was a higher total than the 58% support that Prop. 64 received from all California voters, making Manhattan Beach marginally more liberal on the subject. In the presidential race, Manhattan Beach was very close to the statewide vote of 62% for Clinton. Local voters bucked statewide trends on fiscal matters. Prop. 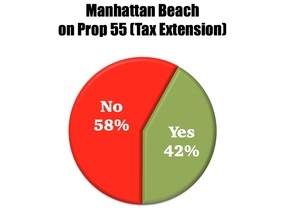 55, an extension of an income tax surcharge, got 62% support statewide, but was trounced in Manhattan Beach, with 58% voting "no" and only 42% saying "yes." A statewide school bond, Prop. 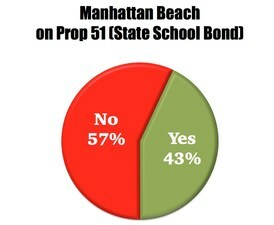 51, got 54% statewide, but was opposed by 57% in Manhattan Beach, with 43% here in favor. Prop. 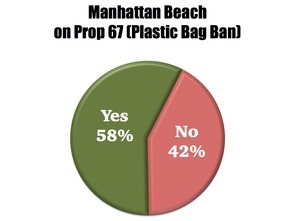 67 asked voters to uphold a state law banning single-use plastic bags, and Manhattan Beach said "yes" by a 58%-42% margin. Statewide, the vote was much closer, with 52% support. MB was one of the first cities to ban plastic bags, with its first local ordinance passed in 2008, upheld by the state Supreme Court in 2011. Props. 62 & 66 pertained to the death penalty. Local voters were marginally more supportive of repealing the death penalty, with 49% saying "yes" in Manhattan Beach, against 46% support statewide. (The repeal measure failed.) Local support for a competing measure, Prop. 66, to retain the death penalty and speed up procedures, matched the statewide vote, with 51% saying "yes." For U.S. Senate, in a Democrat-versus-Democrat election, Manhattan Beach supported Kamala Harris with 69% of the vote. Statewide, Harris received 63%. For state Assembly, Manhattan Beach resident and Republican David Hadley served as the local state Assembly member for 2015-2016, but was defeated last week. The race for the 66th District seat went handily to Democrat Al Muratsuchi, 53%-47%. 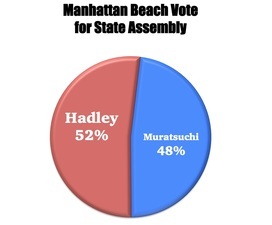 However, Manhattan Beach voters supported Hadley by a 500-vote margin, with 52% support in town. In an officially nonpartisan race for L.A. County Supervisor, similarly, locals favored former Manhattan Beach City Council member and mayor Steve Napolitano, a Republican, but didn't pick the winner. 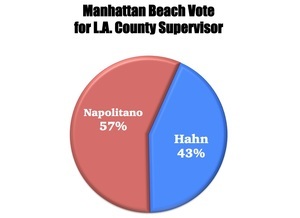 Napolitano received 57% of the vote in Manhattan Beach, but only 44% support across the vast 4th supervisorial district. For the U.S. House of Representatives, local voters were more in alignment with the district as a whole, favoring Democrat Ted Lieu with 58% of the vote. As the incumbent, Lieu received 66% support overall in returning for his second House term. Voter registration in Manhattan Beach is closely balanced: 36% Democratic, 36% Republican and 23% with no party preference. Clearly, there's no one direction that local voters can be expected to go on every issue. Vote totals come from the Los Angeles County Registrar-Recorder, and reflect those counted by the day after the Nov. 8 election. There are ballots still to be counted – provisional ballots and some absentee/mail ballots. The county will complete its tabulations in early December.